The title of this article is ambiguous. Out Run (Disambiguation). 6.68 points at 25 votes (rank 444). 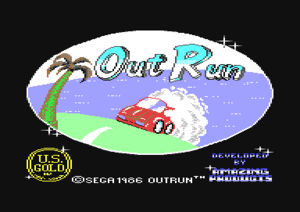 Out Run, also known as Outrun, is an arcade game by Sega. The game was published as a console conversion of almost every famous platform of the late 80s. The aim of Out Run is to race on a track in the shortest time possible with a fast car bristling with PS and a co-driver fitting the luxury limousine. However, the track is not a racing track but a normal US American street. Other cars as further road users make for natural obstacles for our fast car. 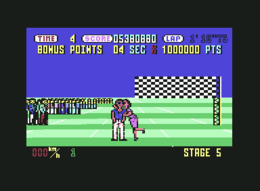 In the course of the game the track changes several times. There are tracks in towns, rural tracks and even desert tracks. If the player reaches the next checkpoint before the time has run out, the rest of the time will be added to the time you have to get to the next checkpoint. If he does not make it, the race is over. When driving through the checkpoint the track changes. Collisions with other cars or objects at the roadside break the car and cost much time. If you whoosh into an object with a too high speed it can happen that the car overturns and driver and co-driver will be sitting on the street. The EU version has in contrast to the US version only one title screen and a menu instead of a track selection screen. However, the scrolling is also very smooth and jittery-free. Unfortunately, the highscore list is also not saved in this original version (available at C64-Games.de in the .zip as "Outrun_Disk-Version.d64"). The first gear is actually only needed at the start and after a total crash. As the time limit for the section is relatively tight, always try to drive in the second gear. When in narrow corners the car tends to drift off the street, do not brake but just stop accelerating for a second (the speed drops). The opposing cars can only get overtaken but not overtake, i.e. after the passing manoeuvre or after a crash you do not need to fear that something approaches from behind. While you should avoid colliding with objects at the kerb or even overturn, you can occasionally use the "bumper kissing" of the cars in front of you to brake, but do not exaggerate or it will cost too much time. 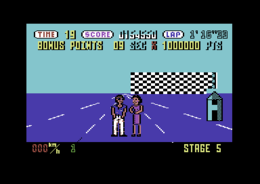 The version by "Lurid+Tricycle" offers next to an own highscore list for each track that can be saved on disk also the following cheat options: collision query off, unlimited time, the car cannot leave the street. H.T.W: "This version pales a bit against the US version by the missing gimmicks as the inexistent image for choosing the track, less pleasingly graphics, the missing display about how far you have driven the track after entering the highscore list, etc.. 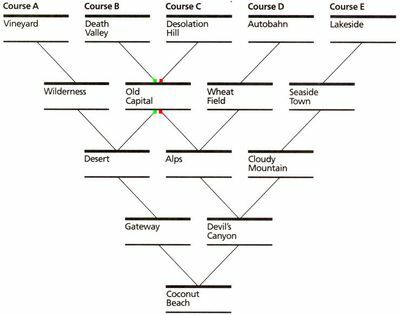 Furthermore, the game is a bit more difficult by the shorter times for a given section of the track (which, however, will rather stand out positively for good players). And so also this version is worth playing again and again and as in the version by "Lurid+Tricycle" (tape version) also the highscore list is saved separately for each track, there is a motivation to reach a higher score". TheRyk: "If you find the US Version too easy, welcome to this one. Even the very first route can not be mastered within the really short time limit if you bump into other cars too often let alone crash. The SFX are even more annoying than in the US version. In my view, the game itself, is hardly different, so I rate the Old Europe variante also very good 7 points." Werner: "Plays rather well. On track B a faulty calculation can occur at the end with the bonus multiplicator. With nine or more bonus seconds at the end, the score display will overrun! 6.5 points"
FXXS: "Well, for me the missing "motor humming" is definitely a too big handicap to have the same motivation to constantly play this version. Therefore one point less than for the US Version and thus 6 points". In Europe this game was released by U.S. Gold and developed by Amazing Products. 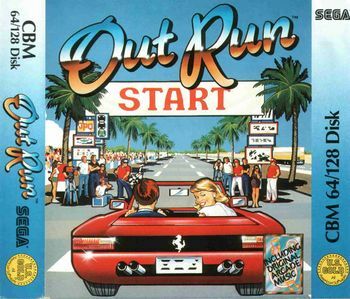 In the USA the same game was published, Out Run (US), but in a revised version by Mindscape, Inc. The game was designed more modernly for the US market. So are e.g. the clouds in the background more detailled than in the EU version. 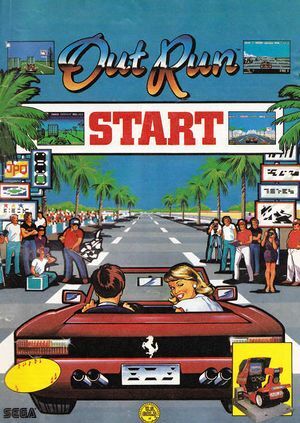 Although the player's car can in every version uniquely be identified as a Ferrari Testarossa Cabriolet and the other road users also have recognizable cars, Sega has never bought a licence of these cars. Only Out Run 2, which was released in 2002, had a licence from Ferrari. 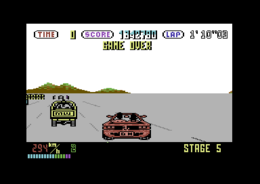 The game included in the first release (double cassette pack) a cassette with the music of the original arcade machine. 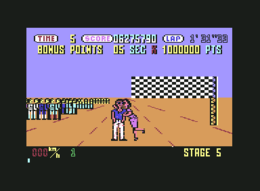 In the arcade version and some console versions the player can freely pick a track during the race, because the track forks at one Checkpoint. 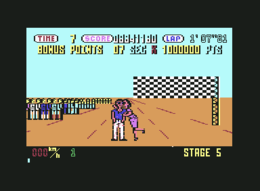 In the version for the C64 you can choose one from five fixed tracks before the start. The game was awarded with the British Golden Joystick Award in the categories Game of the Year and Arcade-Style Game of the Year in 1988. This page was last modified on 28 March 2016, at 18:26.